Thanks Tyron; we look forward to your upcoming service as Vice Mayor. Welcome to this beautiful facility and our thanks to the PUSD for letting us showcase one of its recently completed Prop TT projects. First, let me say that is a continuing privilege to serve as your Mayor, and I appreciate your attendance tonight. I also appreciate my family’s presence. The City Charter requires that in January of each year, the Mayor present a thematic budget message for the stated purpose of receiving and considering public suggestions and comments on the City budget prior to its preparation and ultimate approval by the City Council. So for the past 3 years, I have devoted most of my State of the City speech to our finances. I have provided our residents with a background on how we pay for City services, alerted everyone that the day was approaching when we could not rely on our current sources of revenue to adequately pay our bills, and proposed a 0.75% SALES TAX increase to the voters—Measures I & J—which passed overwhelmingly on November 6th. So tonight, I want to thank the people of Pasadena for selflessly voting to tax themselves—by a margin of better than 2:1—in order to assure our City and its children a better future. Please give yourselves a round of applause. There are a lot of positive things happening in our City, and the passage of Measures I & J is one of them. Tonight will again begin with our finances—where we’ve been, where we find ourselves now, and what we can anticipate in the future. Everything else, charges, fees, unpredictable intergovernmental transfers = $100.6M. 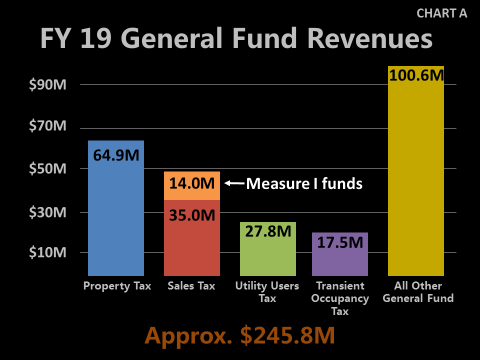 New development and rising property values will continue to be our primary source of revenue and revenue gains, while sales and utility taxes are largely flat except for the infusion of Measure I dollars beginning in July. 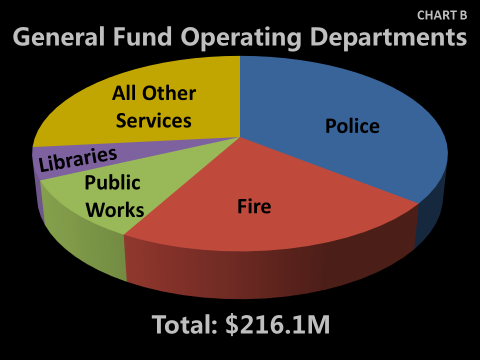 CHART B shows, by Department, how we spend the revenue we collect. An additional $30M, not shown, is non-departmental, like bond debt payments. Everything else, Human Services, Planning, Transportation = $57.6M, down from $58.4M last year. 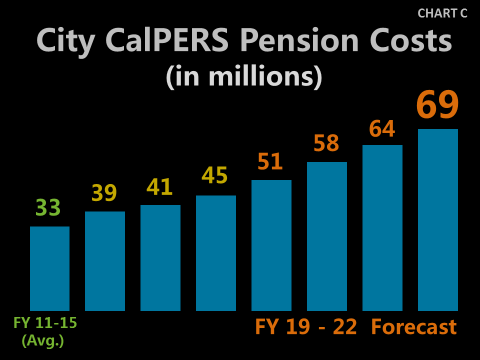 The City’s contribution to the employee Retirement system—CalPERS—continues to take a growing bite out of our Budget (CHART C). There has been a great deal of attention paid to this reality and the actions we have taken to mitigate its impact. 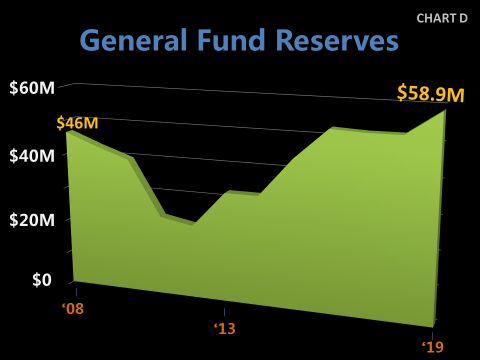 There has also been a lot of attention paid to our reserves (CHART D) which are now greater than pre-recession levels. We have accomplished this by balancing our Budgets, eliminating some staff positions and adding savings generated by one-time payments. Additionally, in June, 2017 the City Council allocated $12M to a special Trust account for future pension and other post-employment benefit obligations, and we allocated an additional $500,000 in FY18, thereby further building our reserves. Measure I raises local sales tax by 0.75% and is expected to provide $21M in revenue annually, 100% of which goes to the City of Pasadena—not to the County or State. 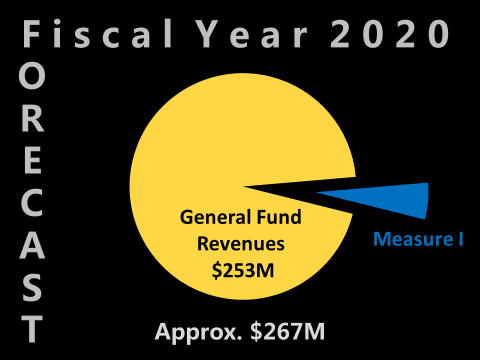 We will begin seeing this revenue in FY 20, which begins in July, and Measure I will help move Pasadena forward. Since our forecasted budget is $267M, it’s not a huge piece of the pie, but it definitely helps, as you’ll see on CHART E which reviews our future income and expenses. Thanks to the voters passing Measure I, Fiscal Year 20 should have an $11M surplus, and looking further ahead you’ll see that because of Measure I, the City will continue to be in good shape through FY 24 with income projected to exceed expenses. Incidentally, the dotted line shows what the City’s income would have been if Measure I had not passed—a deficit of $2.3M in FY 20 that would have ballooned to a $13M shortfall by FY24. This would have meant imposing draconian cuts in order to maintain a balanced budget and a very different kind of speech tonight. 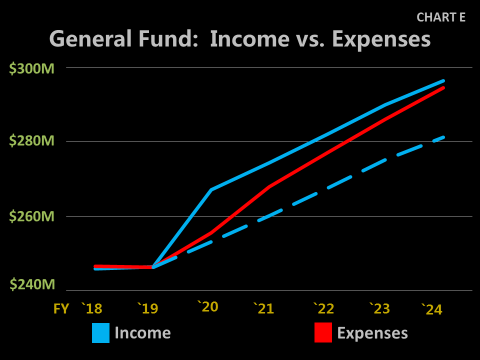 While our forecasting only extends for five years, it appears that despite the additional money received from Measure I our expenses will still increase faster than our revenues. So the obvious question is: will we be confronted with the same deficit problem in 2026 or 2028? Simply put, I really don’t know. There are too many uncertainties in the future to project that far out with any degree of confidence. What we can say with certainty, is that the City budget will always be under pressure from a desire to do more worthy things than we can afford to do. We have forecasted future revenues conservatively and there are several things that could have a big positive impact on our revenue. For example, additional hotels, significant tax revenue from on-line sales, and restored Federal or State funding. These could bend the revenue curve up in a meaningful way. On the expense side, we have built the reserves to try and protect against unanticipated expenses. But we must continue to be very disciplined in how we manage our spending, or we will be confronted with the looming threat of the operating deficit all over again. With all of that in mind, how will we spend Measure I funds? Some might suggest that we spend it on desirable new programs, and there are many worthy causes that we could support. The problem with this strategy is that as expenses continue to grow at a faster rate than revenues, we would be building in a structural deficit issue for the near future as described earlier. Some would suggest that we put all the money in Reserves or pay down some of our Pension deficit. This would be the most financially conservative approach, but it ignores some pressing current requirements that shouldn’t be deferred any longer. Projected Measure I money that will not be required for operating costs over the next five years totals approximately $29 Million. As you can see, the list exceeds that amount by a wide margin. But with careful cash management and perhaps using some borrowing leverage, we can maintain a balanced Operating Budget and make a measurable dent in our capital need over the next five years. Not a small achievement. Now a few words about Measure J. This will share one-third of the revenue raised from Measure I with the Pasadena Unified School District to protect and strengthen our public schools. The PUSD faces its own significant budget challenges, and if they are to continue in their efforts to improve educational outcomes for our children, they need our support. So the City Council has entered into a serious and unprecedented dialogue with the PUSD Board to see how we can use this $7M per year to make a significant difference. This is a long term process that will evolve over time and is a way to engage residents who are not PUSD parents in the well-being of our children. Education matters to our entire community, and we cannot have a great City without a great public school system. Having nearly exhausted you with the required financial portion of my message, please bear with me for a few minutes of easier to absorb current events and aspirational items. Now that both METRO and CALTRANS have abandoned the proposal to build a connection between the 710 and the 210 Freeways, we can move ahead with a series of projects that will enhance transportation throughout the region. METRO has allocated $105M to build a grade separation of the Gold Line and California Boulevard. This is a big, complicated project because of the need to keep the trains running while the construction is underway. It will require much public discussion, careful planning and sensitive design, but I believe that the improvements in circulation and improved access to Huntington Memorial Hospital will make the expense and short term disruption worthwhile. Beyond immediate improvements, we can also begin to address in earnest the future of the terrible ditch inflicted on our City in anticipation of the Freeway project. This is a legacy land use planning effort with all kinds of legal, design and planning issues, but it will result in recapturing approximately 50 acres in the heart of our City for productive uses. To get a head start on what will take decades to complete, the City Manager has a assembled a staff task force to begin to define the issues. I am really excited about this effort, and look forward to a broad public discussion once we have better defined the opportunity. More than a year ago, I announced a new effort to focus attention on our City’s most valuable open space, the Arroyo Seco. A volunteer committee worked long and hard to examine the most pressing issues confronting this wonderful resource and to develop ideas on how we might improve it. This, like the discussion of the recapture of the 710 right of way, is a long term, legacy project. However, I am proud to announce that the Arroyo Advisory Group’s efforts has resulted in the formation of a new non-profit group called the One Arroyo Foundation, and that they have formed a Board of Directors and begun to raise funds to implement the recommended demonstration trails project. I am grateful in particular to my friends Bill Bogaard and Doug Kranwinkle for leading this effort, and I look forward with great anticipation to further progress this year and in the years to come. To support this effort, the County of Los Angeles has agreed to provide $2.5 million to the Army Corps of Engineers so that they can restart their large scale habitat restoration study for the Arroyo which could have profound long term benefits. More immediately, Supervisor Barger has just committed half a million dollars in Prop. A park funding to the demonstration trails project. We are grateful to the County for all of its support to this priceless resource, and I would like to acknowledge it with a round of applause. Homelessness – This is the most pressing problem facing our City. Some positive news includes the initial allocation of County Measure H funding, the passage of a motel conversion ordinance and progress on the Heritage Square South site. I have also proposed that we commit the City-owned, historic YWCA building to permanent supportive housing. Police – The City Manager has selected a new Chief, John Perez, and there is a renewed commitment to community policing and progressive policies to ensure the all of our residents can rely on equitable treatment. Cannabis – The application period is now open for legal sales, cultivation and testing facilities per the direction of our voters, and we anticipate that some will be operational this year. General Plan – Public meetings to formulate the detailed specific plans are underway offering new opportunities for residents to share the vision of what our City will look like over the next 20 years. Development Proposals – There will be new owners and renewed activity for the campuses of Fuller and William Carey University and the new Kaiser Medical School should begin operation. Also, construction is now underway on the largest development project in the City’s history on the Parsons campus in Old Pasadena. State Preemption of Local Authority – With increasing frequency, the State Legislature has chewed away at local authority: dates for local elections, granny flats, sidewalk vending and now threatened preemption of fundamental land use regulations regarding housing. We must stop these intrusions, even if it means litigation. 100th Anniversary – I have been reminded by Councilmember McAustin and Tournament President Farber that 2019 marks the 100th anniversary of the passage of the 19th amendment which finally guaranteed women the right to vote. This year we will highlight the role that women play in our City, and redouble our efforts to make certain that they are properly represented in every facet of City government. In sum, the state of our City is good and equally important, the trend line is positive. While we are truly blessed as a community, there is a growing trend of persons launching fierce and destructive attacks against others who may disagree with their point of view often before knowing all the facts. This is not the way we conduct our affairs in Pasadena. We are better than that. I ask that our community remain actively engaged in our decision making, and do so in a positive and civil manner. In turn, the City Council and the staff will continue to work hard to maintain the positive trend and to secure an improved quality of life for all of our residents. I hope that this evening has been useful for you, and I must thank those who helped put it together. Special thanks to Pasadena High School, Principal Hernandez, students & faculty; from the Office of the Mayor and City Council: Jana Stewart, Araceli Mellem and Rhonda Stone; Pasadena Media’s Chris Miller, Bobbie Ferguson and Danny Hesse; Finance Director Matt Hawkesworth and Public Information Officer Lisa Derderian; from the Department of Human Services: newly appointed Director Brenda Harvey-Williams, Lola Osborne, Leonardo Chavez and Dolores Mendoza; our Northwest Program Ambassadors; and of course, our City Manager Steve Mermell.